The CamJam XT is the ultimate tie-down tool to make light work of securing your heavy loads.The CamJam XT features our signature knot-free CamJam tightening and tensioning technology in a heavy-duty tool designed to tighten, tension, and securely lock serious loads up to 280 lbs. 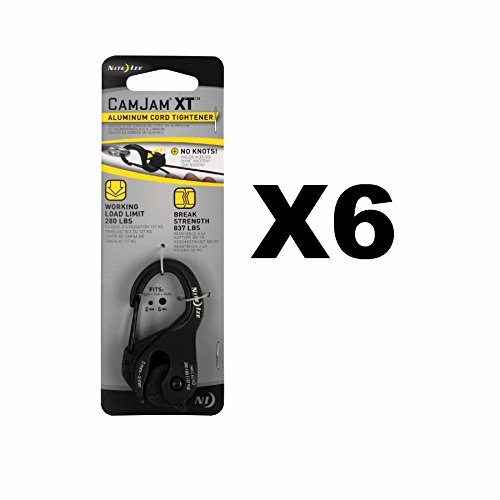 Made of durable, cast aluminum, the CamJam XT holds cords from 1/16"-3/16" (2mm-5mm) in width, and comes in either a single pack or combination package with a 16' (4.88m) length of 550 paracord. Its carabiner clip and gate on one end and rotating cam mechanism on the other allows you to anchor the carabiner to any hook, D-ring, or loop, and feed the cord through the cam until you've reached the desired level of tension. Pull the cord firmly and the cam locks into place and stays that way until you release it by rotating the cam and pulling up on the cord. Easy to adjust and re-adjust the CamJam XT is engineered for superior durability and strength, and can be used and reused hundreds of times, in hundreds of ways. Create a loop by clipping the Cam Jam XT to one end of the cord and pulling the other end through the cam. This loop enables you to bundle or wrap heavy loads and easily secure them. Both the Fixed End and Loop System methods are excellent for securely tying down lumber, gear, and other heavy loads to roof racks, bike racks, and truck beds. It's also designed to hold the cord without tension in a slack configuration allowing for greater versatility of use. Thule Load Tie Down Straps (9 Ft, Pair) - Heavy-duty load straps secure items, such as surfboards, safely to your vehicle’s base rack system.